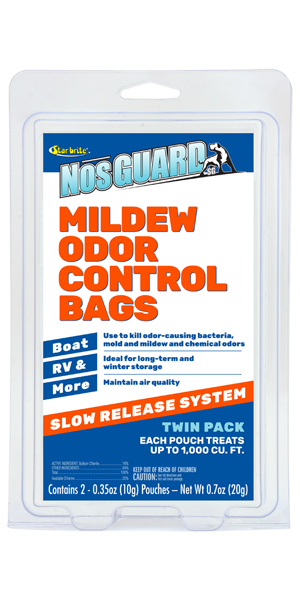 NosGUARD SG Mildew Odor Control Bags Slow Release Formula is the most effective way to eliminate and prevent mold and mildew odor and other foul smells from forming year round. The extended release system allows it to remain effective for up to 3 months, keeping enclosed areas odor-free, crisp and clean smelling. Each patented CLO2 generator pouch treats an area 1000 cubic feet in size safely and effectively. (10' x 10' x 10'). Also try the Fast Release Odor Control System for quick removal of foul smells caused by mold, mildew, pets, food, garbage, and smoke. MDG is not to be used while people or pets are present. Air out the space after treatment. MDG is not to be used while people or pets are present. Air out the space after treatment. Not for sale in Canada or Europe.